For the second year running, Panopto is recognized as a Leader for our significant business growth and expanded product capabilities. Within businesses around the world, video has become the preferred medium for capturing and sharing valuable information, including training activities, internal presentations, employee communications, marketing events, and more. Enabling this new wave of communication is the video content management system (also known as the video CMS or corporate YouTube). Today, corporate YouTubes are transforming the way that organizations create, manage, and share their video content. The 2018 Aragon Research Globe™ provides an independent evaluation of the technology providers that allow an enterprise to manage live and on-demand video. As a “Leader” in the report, Panopto is pleased to offer complimentary access to this research. 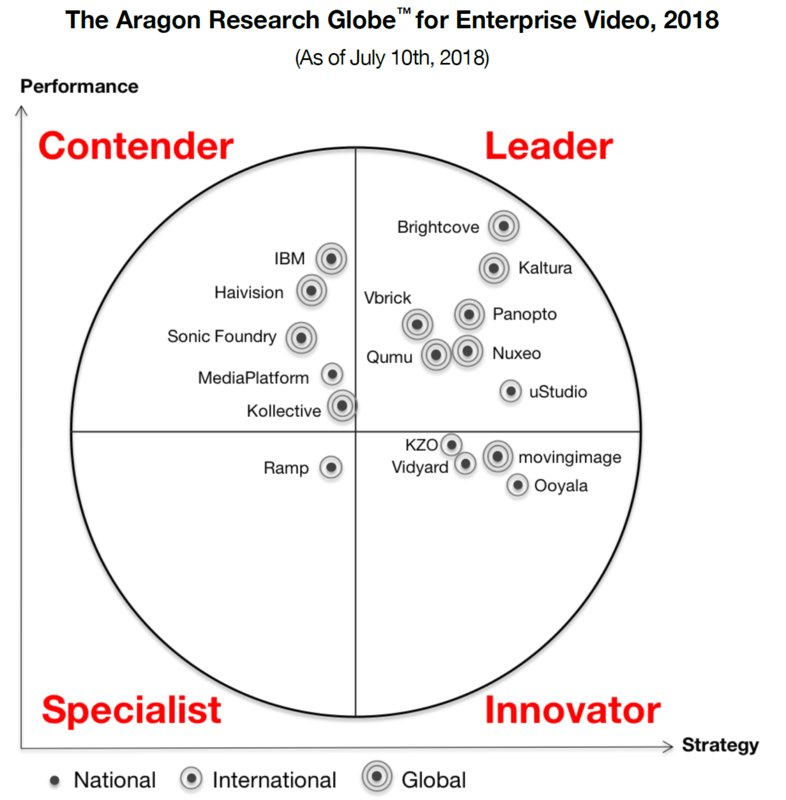 * This Aragon Research Globe graphic was published by Aragon Research Inc. and is part of the Aragon Research Globe for Enterprise Video, 2018. The Aragon Research Globe report is available upon request from Panopto. The Aragon Research Globe is a market evaluation tool that graphically depicts Aragon Research’s evaluation of a specific market and its component vendors. Aragon Research does not endorse vendors, or their products or services that are referenced in its research publications, and does not advise users to select those vendors that are rated the highest. Aragon Research publications consist of the opinions of Aragon Research and Advisory Services organization and should not be construed as statements of fact.